More than any other application type, unified communications requires an optimal quality of experience. CA Unified Communications Monitor (CA UC Monitor) provides the VoIP and video management you need to ensure both quality of experience and network quality of service. The explosion of video traffic coupled with the pervasive use of VoIP compounded by application complexity, all translate to unprecedented IT performance management challenges. Managing voice, video and data over a single IP network challenges organizations in allocating assets for optimum performance of all critical services. CA UC Monitor is uniquely capable of linking unified communications quality of experience through VoIP and video monitoring and reporting with additional data collection and analysis to provide a comprehensive picture of how the converged network is supporting real-time applications. The ability of CA UC Monitor to integrate with tools that manage the underlying IP data network and to manage Quality of Service (QoS) policies ensures your voice and video as well as your critical business applications achieve optimal performance. With CA UC Monitor you can assess the performance of your Cisco Unified Communications Manager (CallManger), Cisco Medianet, Microsoft® Lync®, and AVAYA environments by tracking, evaluating and reporting on key metrics. 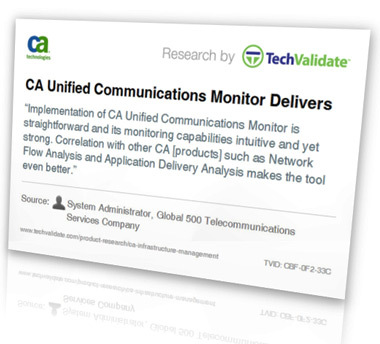 Within a single report, CA UC Monitor displays voice and video quality measurements against defined, industry-standard thresholds for any network segment. 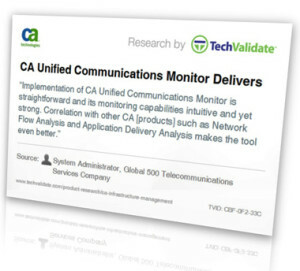 CA UC Monitor is deployed quickly without server agents or client-side probes to provide you with tangible benefits speedily. Monitor voice and video call quality. Report on key call set-up metrics. Provide support for key UC vendors. Integrate with other CA network solutions through the CA Performance Center. Improve quality of your VoIP and video service. Improve capacity planning and updates. Reduce impact of unified communications on your IT network and other applications.